How many new parents would love nothing more than to stay at home with their newborn? While many people may have the ability to do so for the first month or so, maternity leave soon runs out and it’s back to work they go. For the lucky ones who are able to remain at home, winter can often be a hard time. If this applies to you, following some of these tips may help you make it through to springtime and warmer weather without feeling low. It’s not unusual for people to be affected by the changing seasons. During the spring and summer when the sun is shining and temperatures are warm, people are generally happier and more active. 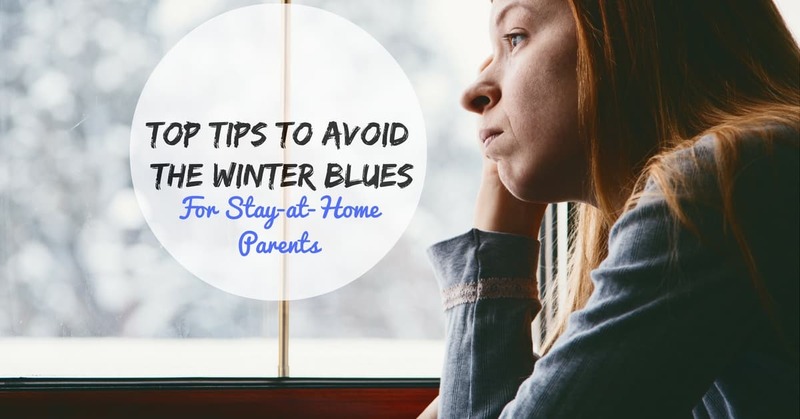 As the temperatures drop and the clock is turned back, many people – particularly stay-at-home parents – start experiencing the winter blues or something more serious called Seasonal Affective Disorder (SAD). The winter blues are caused by fewer daylight hours and having to remain in the home for longer periods of time. SAD can be like winter blues on steroids. People with SAD are often depressed to the point where medication is necessary. If you suffer from either of these conditions, take heart. There is something you can do to avoid or at least lessen the effects. One of the best things you can do if you experience the winter blues or SAD is to use light therapy. Open the shades and let as much natural sunlight into your home as you can. Sitting in the window with direct sunlight for as little as 10 minutes a day can do wonders for your mood. Of course, the more exposure you get to natural sunlight the better off you will be. What do you do if there isn’t natural sunlight? Your doctor can prescribe a light therapy box which will mimic outdoor light. Your brain registers the difference in the amount of light it receives and this will greatly affect your mood. You can take care of two problems at once if you exercise outdoors. Being outdoors will invigorate you. The sunshine as well as being active will lift the winter doldrums. Exercise causes endorphins to be released. Endorphins lighten your mood and help you feel good. If it is too cold to exercise outdoors, you can receive many of the endorphin benefits no matter where you choose to exercise. Simply getting outdoors can break the winter blues. Go outdoors and have a snowball fight with your children. Take a brisk walk or find a hill to go sledding on. Not only will being outdoors help you, it is pretty much guaranteed to help your children as well. Cabin fever, often associated with the winter blues, can also be avoided if you add some color to your surroundings. Even though it looks gray and gloomy outdoors, it doesn’t mean it has to do so indoors as well. Find some bright yellow pillows to toss on your couch. You can also buy a bouquet or two of flowers or exchange your wall art for something new and colorful. It is amazing how adding vibrant, vivid colors to the room can brighten your mood. No one likes to experience the winter blues or Seasonal Affective Disorder. However, they are commonplace to many people each year. You may not think making simple changes like the ones listed above will have an effect on you. However, these tips have been proven to be effective for millions; they can also work for you.